With a New Year come new opportunities; each year I make sure my house has a new bouquet of flowers to welcome the new beginning that January brings us. “I Feel a Kiss Coming On” uses many vintage Americana elements. The vintage Americana imagery adds a sweet flavor to my painting as it combines with the vibrant colors. 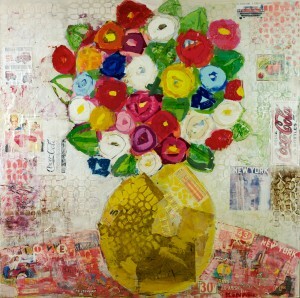 Some other elements seen in the painting are Atlanta’s Coca Cola, and elements of one of my favorite cities, New York. These roaming elements represent one of my many loves, which is traveling and seeing new places, something I keep in mind when making my resolutions for the New Year. Receive updates on the latest artwork and updates from Christy Kinard.